On December 8, 1972, Belle, the Kauffman hotel owner died at age 91. She came to Grand Lake in 1906 and was the town school teacher. Ezra was an available bachelor with a hotel in Grand Lake and needed someone to help him operate the hotel. Belle caught his eye and they married in 1907 and soon had three daughters: Ruth, Rosemary, and Margaret. Belle and her sister, Carrie, were daughters of Ceylon and Mary Ann Nephenthaler Stowell. Belle was born with the name of Jennie Arabella on 3 October 1878 in Briggsville, Marquette, Wisconsin. 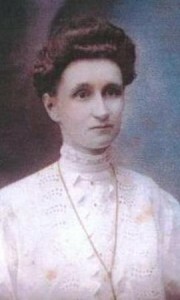 The family moved to New Haven, Adams County, Wisconsin and from there Belle came to Grand Lake. After Ezra died in 1920 she lived in Denver but continued operating the hotel as a summer endeavor. In 1923 she sold the homestead on the North Inlet which was later taken into the Rocky Mountain National Park. She worked as a cook in a school cafeteria in Denver until her retirement in 1948. In her free time Belle wrote poems and short stories. One of her western short stories was awarded a prize by Helen Bonfils of the Denver Post. Belle died in 28 November 1972 at age 93 in Denver, Colorado. I’m Belle Stowell Kauffman – I own a hotel in Grand Lake and the season is about over – I came today to visit the grave of my sister before I head to Denver for the school year. My three daughters and I operate the tourist hotel during the summer – the Kauffman House – have you been there? We have eight rooms to rent and serve three meals a day – I also serve dinners at noon to those in town wanting a hot home-cooked meal. I came to Grand Lake from Briggenville, Wisconsin in 1906 to teach school – the little one room school in town. I met Ezra Kauffman at one of the town dances and we were married in 1907. He was 58 years old and his first wife had left him in 1899 taking their two children with her. I moved into his hotel which he built in 1892. I took over the management of the hotel and kitchen and he continued to operate his barber shop and shoe repair shop behind the hotel. We had three daughters, Ruth, Rosemary who is still living in a nursing home in Denver and Margaret. My little Margaret just died. Grand Lake was a fun place – we had lots of tourists and one of the main events of the summer was a big fish fry – there’s a picture taken of me cooking fish at the annual event in Mary Lyons Cairns book about Grand Lake. I was one of the charter members of the Grand Lake Women’s Club which began in 1912 and met in the homes of the women. One of our first projects was this cemetery. We cleaned it up and built a fence around it and made arrangements with the park, which was established in 1915, to lease the cemetery. My sister Caroline and her husband William Schuster and their two children, Florence and Helen, moved here from Wisconsin in 1910 and homesteaded in the lower valley – down where the Grand River Inn is now. 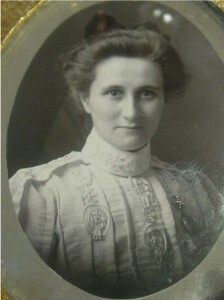 Carrie was a school teacher in Grand Lake in 1913 and 1914. Will was very ill with tuberculosis but he managed to supervise some plumbing work that was done here in the early days. He died in 1915 – he was just 41. Carrie received the final deed on their homestead in 1916. Carrie then married Henry Schnoor and they lived in the large house at the end of the main street in Grand Lake – she lived just two blocks from our house and our girls enjoyed playing together. Henry was a carpenter and had lived on Green Mountain Ranch for quite awhile. He built many log cabins in Grand Lake. Henry’s wife had left him with two young girls. He turned them over to the Harbison sisters to care for – at one time he wanted to marry Kitty Harbison, but she turned him down in order to help her sister and mother on the ranch. When Henry married my sister Carrie, he went to get his two girls back. Beatrice (Bee) came back but Mary wanted to stay in the only home she ever remembered. Henry Schnoor died in 1943 at age 79 and Caroline lived until 1959 – she was 87. Carrie lived here until she died – she was county superintendent of schools for many years, an elected position. Carrie always had a fear of dying in the winter when they’d have to blast her grave. Sure enough that’s what happened, and they didn’t feel they could blast up here by Will Schuster and so her grave is at the other end. Beatrice married Oliver Dolloff but she died at the age of 23 and was buried in the Grand Lake Cemetery in 1927.